Grangetto's Farm and Garden Supply Services - » An Orchid in a Pear Tree? An Orchid in a Pear Tree? Well, not exactly, but close. Did you know that you can actually grow orchids on your trees? You can, if you follow these instructions. Orchids add an extra touch of color to your trees, giving your landscaping a beauty boost. Given the year-round warm climate in Southern California, you can do this with many different types of orchids without worrying about cold weather damage. Of course, you can also hang your orchids in baskets, which allows you to easily move them from tree to tree or bring them indoors to change your décor. Orchids are unique in that they don’t need soil to grow and bloom. In fact, soil will actually smother the roots and kill the plants. We’re dealing with only one of the three types of orchids here, the epiphyte or “air plant.” The others, lithophytes (“rock plant” growing around rocks) and terrestrials (growing in loamy material on the jungle floor) aren’t suitable for hanging in trees. The epiphyte varieties of orchids have adapted to use trees for support; the orchids’ roots cling to the trees’ bark. However, orchids are not parasites; the only food they get from trees is any decaying organic matter in the crooks of branches or animal droppings as they run down the trees when it rains. Orchids get their water directly from the humidity in the air. During dry spells, the plants use water stored in their thick stems, called pseudobulbs. The first step is to choose the right orchids for your trees. Many types of orchids require filtered sunlight so you need to select a tree that can provide this year-round. Oak trees are great matches for Cattleya and certain Brassica orchids. Those in the Schomburgika genus do well with more sunlight so you can hang them on palms and other open-canopied trees. Flat-leaf Oncidiums, Phalaenopsis, and Cattleya do well on mango and avocado trees. 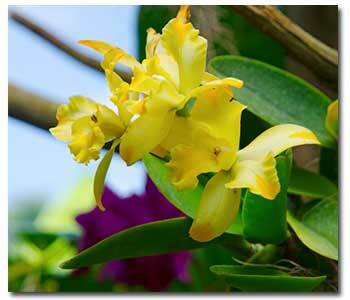 Orchids, being epiphytes, need good air circulation so you must hang them on unobstructed areas of your trees. The process is more successful if done in the spring. If your area is subject to cold winds, it’s best to hang your orchids on the sides of the trees opposite the wind so that your trees act as windbreaks. Once you’ve located the right spot, tie your orchids to the tree with green nursery tape or nylon string. This provides support for your orchids until their root systems bond with the trees. Typically, it’s safe to remove the tape or string after one year. If you prefer the “mobile” option, you can use hanging baskets. No soil, though! Fill your baskets half full with orchid bark or sphagnum moss. Then put your orchids in the baskets and add more bark or moss. Your local Grangetto’s carries the planting medium, needed to make your beautiful hanging arrangement. So if you want a quick, easy way to add colorful beauty to your yard, hang some orchids today!